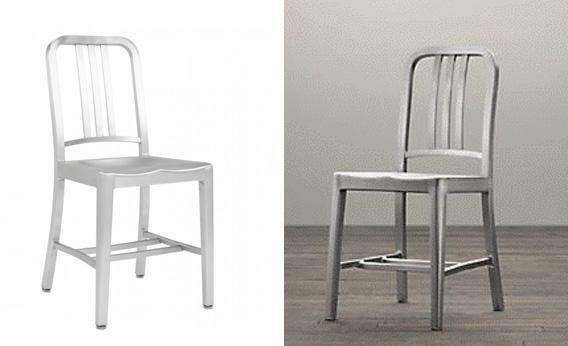 The Navy chair: Restoration Hardware’s imitation of Emeco’s original design is good for the Pennsylvania manufacturer. Can Restoration Hardware Legally Knock Off the Navy Chair? Actually, the big retailer’s cheap imitation is the best thing to ever happen to the original. Product images by Emeco and Restoration Hardware. The Emeco 1006, also called the “Navy chair,” is an aluminum side chair produced by the Electric Machine and Equipment Company (Emeco) in Hanover, Pa. The chair was commissioned by the U.S. Navy in World War II for use on warships: The procurement contract specified that the chair had to be able to withstand torpedo blasts to the side of a destroyer. After the war, Emeco began selling its Navy chair to the public. The original design never sold particularly well, but over the years Emeco’s chair carved out a small niche as a piece of high-end (that is, expensive) design of the sort you’ll see featured in Dwell magazine. That is until Restoration Hardware got into the act. Recently the big furniture retailer began selling a look-alike Navy chair, which it refers to as the “standard aluminum side chair.” (It previously referred to it as the “naval chair.”) The Emeco original is $455. The Restoration knockoff is $129. At that lower price—and given Restoration Hardware’s ubiquity and marketing muscle—the Navy chair was poised to go mainstream. That was something Emeco was not going to take sitting down. The company has now filed suit, accusing Restoration Hardware of violating its trademarks. Restoration Hardware has apparently responded by taking the chair off its website. They shouldn’t have. The lawsuit is very likely meritless. And it points to the problem in granting overly broad rights in names and designs via the trademark system—especially since trademarks, unlike copyrights or patents, can last forever. Let’s turn to the dispute itself. First, Emeco’s claim to a trademark on the term “Navy chair” is weak. Why? Because over the years that has become a generic label for this type of all-metal, 1940s-style chair, rather than a name that immediately conjures up a Pennsylvania company named Emeco. And in American law, if a product’s name becomes generic—such as aspirin, linoleum, thermos, or zipper—it can no longer be trademarked. Lawyers call this “genericide,” and the fear of becoming generic is one reason Kleenex is always reminding you that they sell “Kleenex-brand tissues.” The makers of Kleenex are trying to save their brand from genericide by reminding you that Kleenex is a particular brand of tissues, not a generic name for tissues. In any event, Restoration Hardware isn’t using the name “Navy chair” anymore, so even if Emeco wins on this claim, it’s a pyrrhic victory—Restoration Hardware will be entitled to go on selling the chair under the unexciting but perfectly serviceable “standard aluminum side chair” label. But Emeco has a second claim. It argues that it has a trademark on the chair’s design as well as its name. This claim is also a stretch. The Supreme Court has been very skeptical of such “trade dress” claims in which a firm asserts ownership over how a product looks. The court has said that firms can claim trademark rights on the design of products only if they have achieved what lawyers refer to as “secondary meaning”—that is, if the design is recognized by a substantial number of consumers as synonymous with the product itself. This is possible but very rare. The sinuous design of a Coca-Cola bottle is protected, for example, because people widely recognize a bottle of that shape as synonymous with Coke. Is Emeco’s Navy chair the home furnishing equivalent of a Coke bottle? No. It may be that a small number of industrial-design fans believe that chairs that look like the Navy chair come from a single source (such as Emeco). But actually they don’t—the Navy chair has been knocked off for years by a number of firms. Here’s a knockoff version by Advanced Interior Designs. Here’s another by Interiortrade. And here are knockoff Navy chairs in various colors by Globe West. Matt Blatt has done Navy chair knockoffs as well. Heck, at one point, even mega-retailer Target was doing a knockoff. For the same reason that the Navy chair name is probably generic (a lot of firms have produced very similar chairs under that name), the design almost certainly doesn’t indicate any single source of the product (because consumers have been getting their Navy chairs from a variety of sources for years). The bottom line is that Emeco can’t stop Restoration Hardware from knocking off the Navy chair. Now, your first instinct may be to condemn Restoration Hardware as a copycat. You may worry that if Restoration Hardware can get away with copying Emeco’s original design, that’s bound to discourage others from coming up with new furniture designs in the future. But that first instinct can mislead. In our book, The Knockoff Economy, we look at industries like fashion, cuisine, financial innovations, fonts, databases, and open-source software in which there are lots of copying and knockoffs (often perfectly legal) but also lots of creativity. In all these industries, copying and creativity coexist. In fact, copying often leads to more creativity, not less. Consider the fashion industry. Anyone who has spent time in a Forever 21 store knows that fashion is full of knockoffs. And all this copying is completely legal because copyright law doesn’t cover apparel design. Yet far from killing creativity and destroying the market, the industry is prospering. How is that possible? Because of something we all know instinctively about fashion. People typically buy new clothes not because they need them, but because they want to keep up with the latest style. Without copyright restrictions, fashion designers are free to rework a design and jump on board what they hope will be a money-making style. The result is the industry’s most sacred concept: the trend. Copying creates trends, and trends are what sell fashion. Every season we see designers “take inspiration” from others. Trends catch on, become overexposed, and die. Then new designs take their place. This cycle is familiar. But what is rarely recognized is that the cycle is accelerated by the freedom to copy. So copying is a central, and beneficial, element of the fashion cycle. But that’s not the only way in which copying sparks creativity. Copying can also serve as advertising. When a popular fashion design is imitated, more people see it and experience it, which helps to create buzz and allure. Copies can also serve as trial versions of the original. A 2009 Harvard Business School study found that many women who buy knockoff handbags soon move up to the real thing. Copies act as a kind of gateway drug to the more expensive genuine article. Which brings us back to the Navy chair. What are the effects of cheaper knockoffs on Emeco’s $455 original? We don’t know for sure how many buyers of Restoration Hardware’s $129 version would have bought the Emeco original if the cheaper knockoff didn’t exist. But we suspect the answer is not many. Emeco’s chair is handmade in the United States using high-grade recycled aluminum and a painstaking 77-step manufacturing process. The much cheaper Restoration Hardware knockoff is made in China and is of palpably lower quality. It may well be that, just as with knockoff handbags, the main effect of the Restoration Hardware knockoff chair is to signal to the Emeco chair’s real audience—the fortunate few wealthy enough to spend $3,000 for a set of 6 dining chairs—that the design remains relevant and desirable. Along the way, the Restoration Hardware version—appearing in malls and mailboxes everywhere—will educate a much wider swath of furniture buyers about the real thing. If that’s true, then the Emeco chair isn’t going to be hurt by knockoffs. Indeed, Emeco might well prosper. More broadly, why should only the wealthy be entitled to have good design in their houses? No one really needs a chair in his dining room built to withstand a torpedo hit. Perhaps if Emeco was concerned about knockoffs it could have made a less expensive version before Restoration Hardware did. In any event, calling Restoration Hardware’s version of the Navy chair a knockoff doesn’t really do it justice. There is another, much more attractive word that fits at least as well: competition.